Looks like Disney is going hipster. 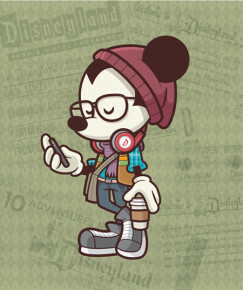 Here’s a pic of Hipster Mickey that will be part of a Hipster Cocktail Party on July 18th at Wonderground Gallery in Disneyland. Find out more here. Will it come to Vinylmation too? Disney should be Disney and not try to smooze every culture to get them to follow Disney. They should be leaders of the culture that they have been successful with over the years. Don’t get me wrong, you have to adapt but you also have to be yourself. That said, Mickey looks plain weird!